Founded in 1762, the same year as Barings Bank, Equitable Life used to share the same reputation for probity. That reputation evaporated in 1999 when the insurance company went to court in an effort to renege on its promises to policyholders. It won a shameful judgement, but lost in the Appeal Court. By December 2000, unable to fulfil its £1.5 billion obligations, or find a buyer who would, it closed to new business. That was just the tip of an iceberg of scandal revealed during the following decade, and marked by a series of stitch-ups involving the government, the courts and every regulatory body supposed to safeguard innocent consumers. The affair is still unresolved, and though all parties continue to use the euphemistic language of diplomacy and the law, it’s a saga of unremitting greed, vicious disregard for responsibility and evasion of the most straightforward truth. Claim has followed counterclaim in the cause of delay. Blame for ‘regulatory failure’ passes back and forth while newly sensitized financial services authorities alternately support and excoriate schemes to buy out arbitrarily selected groups of policyholders. A 2008 enquiry found that a million people had lost half their life savings because the government painted ‘a wholly misleading picture’ of their investment risk. Or someone else did. Meanwhile some 30,000 policyholders have died, waiting. More poignantly, the other few hundred thousand need their money to live in the manner they saved so assiduously to achieve. Currently, Equitable Life presents itself as one of the hapless victims, and is visibly delighted that after so many years and 13 reports, it looks as though the company will not only survive, but won’t have to pay a red cent where it is due. Roll on the bonuses! 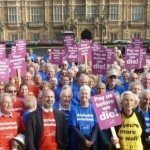 The ‘collapse’ of Equitable Life is proving to be as much a humanitarian disaster as a commercial one. It’s not as though it presents any moral dilemma. Toll: Many thousands of Equitable Life’s policyholders have suffered greatly following its collapse and prevarication. Collaterally, the disaster has caused intense scrutiny of aspects of the insurance industry and other financial services; and further legislation is being drawn up to replace the interim, provenly toothless, reforms. Unfortunately, so far they don’t include a bill to outlaw the corporate and political abuse of legal nitpicking. You should know: ln 2008 one of the many reports proposed an independent body to decide how much of the policyholders’ losses was caused by maladministration (as distinct from the company’s later market collapse). According to The independent ‘the Equitable Members Action Group (EMAG) suggests this amounts to £4.65 billion’.